IMPORTANT NOTICE: Breast milk is best and is recommended for as long as possible during infancy. 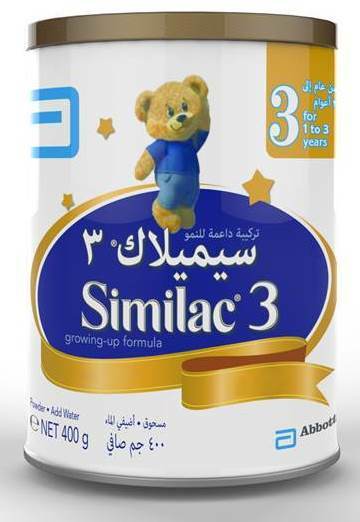 If breastfeeding is not adopted, Similac 3 is formulated for children from 1 year and onward and may be recommended by your doctor. Contains a unique combination of ingredients close to those found in breast milk , including AA , DHA , and taurine , to help support brain development . Contains a blend of nutrients based on breast milk to help support the immune system . Contains nucleotides to help support gut maturation. Supports your baby’s developing immune system. Contains a unique vegetable fat blend , without palm olein oil , that was scientifically developed to support calcium absorption for strong bones and overall growth.